The buzz is that China real estate is back. After nearly a year of steep discounting, with both land and housing sales in April looking like they were falling of a cliff, the market was electrified in late May by stories of would-be home-buyers lining up around the block and entire luxury developments selling out on the days sales opened. China Securities Journal reported that Beijing housing sales were up 46.5% YoY in May, Xinhua reported they were up 50.6% YoY in June, and property agency Centaline says they’ve continue to surge at 37% YoY in the first half of July. Over Dragon Boat Festival weekend, in late June, China’s Housing Ministry said sales volume for Beijing residential property soared 289% YoY (nearly 4x), and Centaline said six other cities saw sales growth greater than 100% YoY that same weekend. In Shanghai, housing sales surge 65% WoW in late June and, according to China Business News, primary market sales that month rebounded close to their five-year average. Securities Times reported that, even in 2nd-tier Wuhan, primary market sales were up 18.7% YoY in June. Word is that property developers, encouraged by the turn-around in sales, have begun ditching discounts and raising their prices again. Official statistics for June showed property prices rising in more cities (25) than falling (21) for the first time since last September, with Dow Jones calculating average nationwide prices increasing by a modest 0.02% after eight straight months of decline. Online property site Soufun said nationwide home prices rose 0.1% MoM in May, the first gain in 10 months, while the China Real Estate Index System (CREIS) showed the national average rising 0.05% MoM in June (with Beijing prices bounding ahead by 2.3% MoM in June). Just this week, Tiahe Group put a new batch of luxury villas on the eastern outskirts of Beijing onto the market for the eye-popping price of US$47.5 million each, which works out to RMB 200,000/sq. meter or $2,925/sq. ft. (for reference, the average price on Manhattan’s pricey Upper East Side is $1,426/sq. ft.). Perhaps encouraged by such trends, Longfor Properties, Agile Property Holdings and Evergrande Real Estate Group all made big land purchases in recent months, with Evergrande paying a record-setting RMB 33,000/sq. meter for plot in Guangzhou. This month, developer SinoBo easily topped them by paying more than RMB 41,000/sq. meters in a Beijing land auction. However, other numbers tell a very different story. According to data from China’s National Bureau of Statistics, total floor space sold was down -9.3% YoY in May, and -3.3% YoY in June. Total sales in June rebounded to +6.9% YoY, the first gain this year, but hardly makes a dent compared to the 33% YoY increase in units for sale. Meanwhile, land sales resumed their downward slide to -22.4% YoY in June, and new starts were down -16.3% YoY that month, the worst this year. As a result, growth in total floor space under construction has steadily declined, from 35.5% YoY at the beginning of the year to 17.2% YoY in June. I’ve been hearing more and more stories about that construction being put on hold, a storyline that appears to be validated by the fact that completions, which were up 45.2% YoY in January, have fallen to 0.3% YoY in June — basically flat compared to last year, and heading into decline. No surprise, then, that growth in real estate investment has fallen from 27.9% YoY for 2011 to 16.6% for 1H12 and 11.8% YoY in June — numbers that will feed directly into lower GDP growth. Standard & Poor’s Ratings Services says China’s more than 80,000 developers could face a battle for survival as a wave of short-term property loans fall due this year. The risk is that these businesses could become so desperate they will either default, leaving behind half-finished projects at a time economic growth already is slowing, or start offering steep discounts, triggering a price war. Securities brokerage China International Capital Corp. estimates that about 223 billion yuan ($35 billion) of trust loans are due to mature this year, almost half of which reach maturity between July and September, with a further 282 billion yuan due next year. Combined, that represents almost 75% of all outstanding trust financing to the property sector at the end of 2011. With developers under this much pressure, it’s hard to imagine the market suddenly turning into a seller’s paradise. So what’s really going on with China’s property market? Is the rebound in sales real, and if so, can it last? Is the market bottoming out, surging back, or seeing one of those false rallies that precedes an ever steeper decline? Since the decline in China’s property market since the end of last summer has been something of a leading indicator of the nation’s broader economic slowdown, and since the assumption of ever-rising property prices underwrites a large part of China’s lending, it’s important to get to the bottom of this question. If China’s property market is on truly on the mend, it bodes well for a much-anticipated recovery in the 2nd half of this year. If it’s still broken, things may get worse before they get better. I’m going to walk through each of these theories in turn, and try to determine which of them — if any — offers the most credible explanation for what’s happening in the market. 1. Lower prices are bringing buyers back. For a while now, one of the main concerns about China’s property market is that prices have spiraled so high that most potential homebuyers find them unaffordable. But with prices dropping, and wages rapidly rising, maybe that equation is changing, with more buyers willing to snap up what are starting to look like good deals. 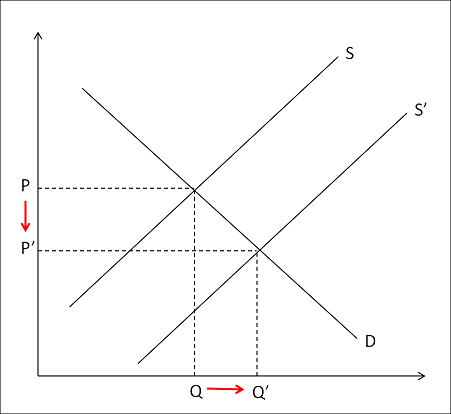 The chart below depicts how an economist would see the process: the supply curve shifts outward as overzealous developers build more than they can sell at prevailing high prices, leading them to cut prices and moving the market equilibrium point down and right along the existing demand curve. The behavior of buyers hasn’t changed, but offering them lower prices translates into greater quantity sold. Based on anecdotal evidence, this certainly does appear to be the rationale many would-be homebuyers are giving for re-entering the market. As one 29 year-old buyer recently told the Financial Times, “Everyone has been paying attention to this development, because it is a big one. I saw the prices go down and I thought they were now reasonable. I can’t see them falling by much more.” In early June, a senior official with Beijing’s real estate industry association told Jinghua Times that the reason for strong May sales was aggressive price-cutting, and that when a few projects tried to raise prices, they saw sales fall off immediately. The problem with this explanation is that — according to official statistics at least — prices haven’t fallen all that much and are starting to rise again. Dow Jones calculates that prices in June were a modest 1.3% lower than a year before, while Reuters estimates 1.5% — not much to get excited about, if you’re a stretched Chinese homebuyer. And if higher demand is the effect of lower prices, there’s absolutely nothing in that dynamic that would cause prices to go back up — which is what we’re told is now happening. There are two possible answers to this objection. The first would be to not put too much credence in the official price statistics. When prices were rising, over the last few years, there was a noticeable disconnect between the rapid price increases people were seeing the ground — prices doubling in 2-3 years — and the modest rises reported in the official statistics. Over the past year, there has been a similar disconnect between the 20-30% discounts regularly offered at point-of-sale and the 0.1-0.2% MoM price declines in the official and “independent” (CREIS, Soufun) indices that still get much of that get much of their data from the same industry and local government sources. There’s plenty of reason to believe that actual prices rose a lot more — and have fallen a lot more — than the official data suggests. Second, if rising incomes are indeed part of homebuyers’ calculations, then we need to understand the “Price” axis on the supply-demand chart as indicating real rather than nominal price. If other prices, including wages, are rising due to inflation, then home prices actually don’t need to fall much (or at all) in nominal terms to become more affordable in real terms. The Shanghai E-House real estate research institute, for instance, calculates that China’s price-to-income ratio for houses peaked at 8.1 in 2009, fell to 7.4 in 2011, and will decline further this year — in part due to rising wages, in part to falling (nominal) home prices. What E-House’s affordability ratio doesn’t explain very well, however, is why the latest sales boom appears to be centered on cities that still have extremely high price-to-income ratios, like 12.4 in Shanghai, 11.6 in Beijing and 15.6 in Shenzhen. If the recovery in sales volumes really is being driven by lower prices (either nominal or real) that’s hardly good news for developers. It means that for the market to clear — for them to sell down the large inventories that are weighing so heavily on their finances — prices will have to drop even further, or at least not rise for some time. That means a continued squeeze on their profits, which some may not be able to sustain. That’s why most developers prefer an alternative explanation of what is happening, one based on a burst of pent-up buyer demand. ← Am I a China Bear? Is it true that the government is giving a monthly allotment to government workers who purchase a home. Apparently for two workers it is enough money to make the payments. If this is true, could this program be responsible for at least some of the increased sales? Professor, hope you have some more time to address the apparent contradiction between what the government says and what is happening on the ground with regards to prices. I think it’s very interesting to hear the government keep harping on about how housing prices have to drop in real terms, then turn around and lower interest rates. Do they really think these new loans they are desperate to give are truly going to stay out of real estate? There’s no way they could possibly believe that. If wages are really rising 10-15% yoy and housing prices are rising at 1-2%, I guess the gov is successful in their objective, right? It should close the gap eventually, but it would take years and the developers probably aren’t going to be able to service their loans. I have no doubt that the gov will step in and subsidize the developers to the high heavens just to keep the party going a little longer. After Shandong Helon, I think it became clear that nearly every company is too big to fail. Looking forward to the rest of this series. My initial impression is that people have seen the slight uptick in prices these past couple of months and are rushing to buy thinking the market has already bottomed out. That and the fact that the stock market has been abysmal. 80,000 developer is really a huge number and rally for real estate is also huge one,i am so really impress when i read about it,as an agent in Finland country most of the real estate are not that so good there is some going down and there is some increasing.Well thanks for sharing. Much appreciate your considerable insights and analysis into such an important and a fascinating conundrum. Precarious looking…. In my humble opinion we urgently need a global land tax revenue pool as a safety net, an iconic just foundation for a new era of transparent capitalism Land is the motherlode and source of most if not all wealth, even patents are territorial. Seems like everywhere we let the same insider cronies in govt/local govt, banking/finance, construction and real estate mesmerize us with an ever bigger house of cards. Globalised bubble-onomics ends in mega-crash? : CRASH TEST DUMMIES OF THE WORLD UNITE!